The Open LFB 2012 goes down in the history of French basketball with the event completely sold out. Women's basketball has really hit France since the Olympic Games with already 2500 EuroBasket Women 2013 tickets bought upon availability to the general public. Most of the weekend was spent honouring the 12 players who represented France during the Olympic games so that even the traditional photo shoot kicking off the LFB Open was low keyed. At the same time the draw for EuroBasket Women 2013 was also on the agenda. With the disappearance of Challes-les-Eaux, only six teams have appeared in each Open LFB: Bourges Basket, Lattes Montpellier, USO Mondeville, Tarbes, Villeneuve d'Ascq and Aix-en-Provence. 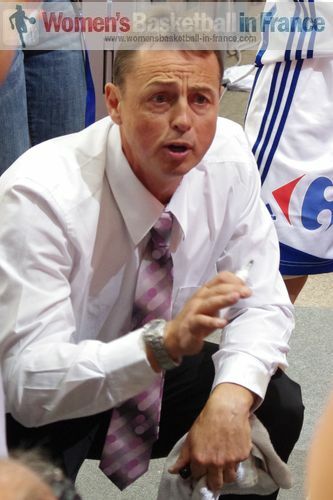 Valéry Demory (in picture) is the only coach to have participated at all the editions of the opening day in Paris. He was the coach at Mourenx for the first two editions and since 2007 he has been with Lattes Montpellier. Bourges Basket are the only team to have won each time they have played at the Stade Pierre de Coubertin in Paris. While there were no real shocks this weekend, Charleville-Mézières and Lyon BF walked away with an Open LFB victory for the first time. 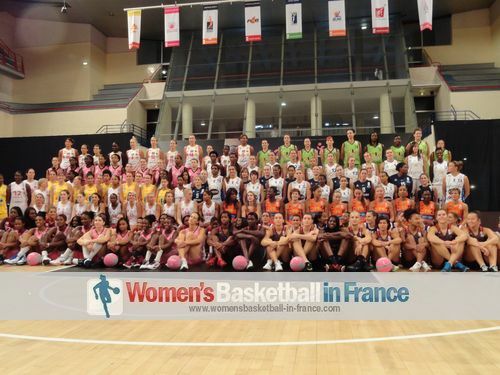 womensbasketball-in-france (wbbif) also made a change this year by covering all the games in English and French. By clicking on the links of the matches on the right, you may find on each page its match report, pictures and the video of the full game. wbbif have also produced a video slideshow in association with Miguel Bordoy Cano and Rubén Moreno which can be viewed below.